The key target has been to reduce downtime or the time the machine is not running. If you analyse the operation of a slitting machine, it can often spend more time not running than running. The two main areas of downtime are due to a job change and a roll change - either finished rolls or parent roll. However, even within these causes, there are many items that build up to contribute to the total downtime. It is also necessary to ensure that the machines are producing good and consistent quality when they are running. To understand the approach that Universal has taken, it is easiest to move through the slitting process from unwind to rewind. In common with most slitter manufacturers, Universal offers a shaftless unwind with floor pick up on its X6 range of slitting machines. The Universal unwind moves vertically up/down to pick up the roll from the floor. Unlike pivoting pick up unwinds, the roll will always be in the same position on the floor, regardless of diameter, for the arms to engage with the core. The operator is provided with a remote control to operate the unwind arms so they can easily check that the chucks are entering the core correctly. This may only save 30 seconds per set up, but over a year, that adds up to a lot of time. Correctly positioning knives, especially shear knives, can result in considerable downtime. Universal have developed an automatic knife setting system that can set 20 male and female shear knives in under two minutes. By the time a new parent roll is loaded into the machine, the knives are already in the correct position. The system can also position the guiding sensor so the material will be lined up with the knives. As well as saving time, the accuracy of the setup is improved and as the knife position is known, the cores can be accurately positioned to line up with the knives. Although shear knives take the longest to set, these benefits still apply to razor slitting. The male knife holders used as part of this system can be hold either razor or shear knives making it quick to change cutting system and allowing a mixture of shear and razor if required. Most slitting machines are supplied with differential friction shafts to control rewind tension. These shafts rely on the control of friction to give you the correct winding tension. This can change with time. Using load cells to measure and control rewind tension is the only way to ensure your finished rolls are wound at the correct tension. Correct winding tension is essential to ensure good quality rolls are produced. The actual winding tension profiles can be recorded as part of the quality assurance record for the rolls produced. Universal also add an extra tension zone through slitting so you can increase the slitting tension without changing the rewind tension. When a set of rolls is complete, the machine comes to halt and the operator then unloads the rolls. To reduce this downtime on a duplex slitting machine, Universal now offers a system that reduces the time from when the machine stops to when it starts winding again to under a minute. This is a huge time saving compared to the time an operator normally takes to remove finished rolls, re-core and re-start. The machine will repeatedly run at this speed - the machine doesn’t get tired or need to go for a break. As well as saving time, the system ensures the cores are always lined up accurately with the slitting knives and manual handling of the finished rolls is reduced. The fast unloading technology can be incorporated into Universal’s X6T turret slitter for the ultimate high productivity machine. 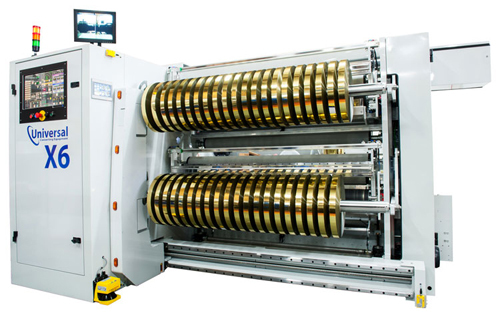 However, for most applications where flexibility is required, the system is supplied with the Universal X6 duplex slitter giving the level of performance which could only previously be achieved with a turret slitter. We believe that this is the future for slitting. It will not suit all applications, but for a large proportion of slitting requirement it offers the chance to greatly increase the output from a single slitting machine and also reduce the labour required to run the machine. The technology has been cost engineered to make the system affordable. How much is this technology worth? As an example, if you saved 30 minutes per set up and you have four set ups a day, you now have two additional hours of production per day. If that time is worth £100/hr you have saved £200/day. If you assume that the machine operates for 250 days a year that is a saving of £50,000 per year. Over a ten year period the technology has saved £500,000.